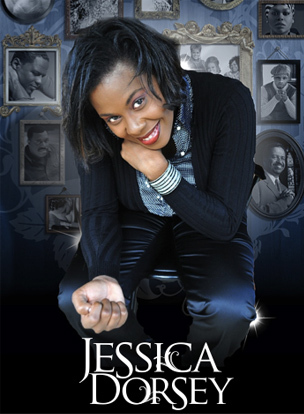 Watch the VIDEO for “Nul n’est comme Toi” (No One Like YOU), from french Gospel Artist “Jessica Dorsey”!! She is an amazing artist that has a wonderful message of Christ’s Power and Love in her music. Take a look, you will LOVE IT!!! 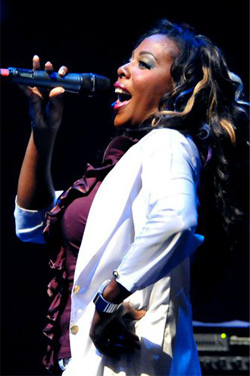 She is an artist with exceptional talent, and many people are considered her as the most American French singer of Gospel. 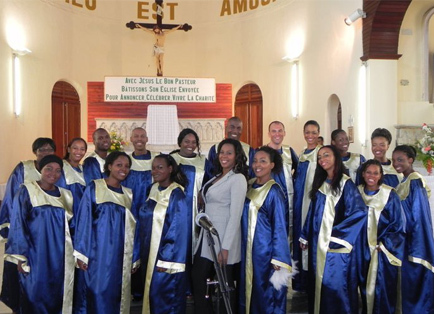 The editor of Gospel-Magazine has wrote : “we found the authentic pearl of the french Gospel Music”. By concert, Jessica is a volcano who shake the ground, with her dynamic music, she sprinkles spectators with many emotions… thrills are guaranteed by the organizer ! The most American of the French singers, the authentic pearl of the french gospel is, Jessica Dorsey. She sang for the Memorial of Dr. Martin Luther King in the Caribbeans, she was a cho- rist of Richard Smallwood, on the first part of Kirk Franklin, then on European Tour of Joann Pickens… An interesting start for this young artist. Her first single «Ou sé lanmou» was rated #2 in USA at Chicago on Synergy1Radio during 8 consecutive weeks ! It’s the first time that a french gospel artist is rated on U.S. Radio… This title is the new «french-creole» version of «Well Alright» of Cece Winans, and many americans are already purchased her album ! André L. Carter (Gospel Synergy) said : “This is the perfect example that Gospel Music is universal”. “Nul n’est comme Toi” [Translate : No One’s Like You] was produced by Angelsway Music, the Gospel Label in the Caribbeans. Jessica Dorsey sings her suffering, her love for God, and her fears. 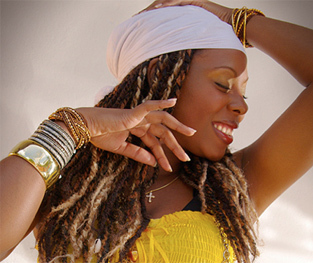 Lyrics speaking to us about the modern issues of faith, the fears of the new christians genera- tion… Jessica flowing on several musical styles like Old-Shool, R’n’B, Funk, Soul-Jazz, Neo- Soul, Latin-Beats and Pop/Rock. An album worked with very carefully in order to grow up a bit more the French Gospel Music. Jessica Dorsey, she is gentleness cherishing power, she is pliability entwining its tenacity, she is dynamism living on its peace and she is tolerance craving respect from the others. These possibilities show what she brings out by nature as an artist who has not stopped dazzling people who meet and discover her since three years old… She was born from a Christian family and her mother has learnt her to enjoy singing, listening to nice melodies and recognize the importance of sumptuous music accompanying famous Jazz, Biguine or Gospel artists… When she was fourteen years old, she gave Gospel artists preference… So she began to visit entertainment rooms, churches and studios to find her “voice” and became very important in the Gospel circle owing to her innate talent. Nowadays, she is known and experiences good musical plans. Introduced to music and singing from an early age by his mother, Jessica Dorsey, 28, became an artist through and through nails. Bathed in the world of Gospel, Jazz and the Biguine, she impose her voice and seems to have no difficulty to sing in soprano, alto and even tenor. This talented artist has rarely been sought from several formations, including groups : Alliance, Synoptik, NuGen… She also works with various artists on their albums, takes over leadership of choir and establishes other choirs. This album is the first solo on which it strives to be reflected in every note, every emotion of her… Any state- ment by the quality of interpretation of this young Caribbean woman. Exceptio- nal. Rare. (Sephora Music). This young artist aged twenty-eight is different from the others because of her voice…As soon as you hear her hot and sweet songs, you will be surprised like most of her audience… Then you will be impressed and delighted with the happiness she shares on the scene… Assured of all that she has learnt that drove her to be a much-travelled artist through the West In- dies and France. Jessica can sing soprano, alto and even tenor notes easily ! Indeed her very strong voice can succeed in it… As you can imagine, Jessica Dorsey is not a simple artist. She is an uncommon-talented artist. Qui est Jessica Dorsey ? 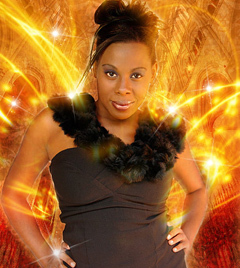 Elle est une artiste au talent hors du commun, et son public du moment l’a considère comme la plus américaine des chanteuses de Gospel francophone. Le rédacteur en chef de Gospel-Magazine l’a ainsi nommée : «La perle authentique du Gospel Francophone». Jessica c’est une voix unique dans la francophonie. Une générosité scénique qui est le strict reflet de sa nature profonde. Ainsi le public la perçoit tel quel est, sans artifi- ces, avec comme seule arme de séduction, son talent qui conquit à chaque fois et sans exception, un public toujours plus nombreux. Ceux qui viennent l’applaudir pour la première fois en concert n’en ressortent jamais indemne… Sur scène, Jessica est un volcan qui fait trembler le sol : une musique percutante, elle arrose abondamment son auditoire en émotions fortes… les frissons sont garantis par l’organisateur à l’entrée, ou rembourse le billet le cas échéant ! Son premier titre extrait, «Ou sé lanmou», a été hissé à la 2e place du Top 100 de Gospel 1 Synergy aux Etats-Unis. C’est la première fois qu’une artiste de gospel français est classée dans des Charts américains. Ce titre est la version créole de «Well Alright» de Cece Winans. André L.Carter (Gospel Sy- nergy) dit d’elle : «C’est le parfait exemple que la musique Gospel est universelle». «Nul n’est comme Toi» a été produit par Angelsway Music, le label de Gospel des An- tilles. Jessica Dorsey y chante ses souffrances, son amour pour Dieu, et ses craintes. Un album riche de bonne humeur et de dyna- misme, à l’image de Jessica. Jessica Dorsey, c’est la douceur qui caresse la puissance, c’est la souplesse qui enlace sa téna- cité, c’est le dynamisme qui se nourrit de sa paix, et c’est la tolérance qui réclame le respect des autres. Ces atouts sont, le reflet de ce qu’elle dégage naturellement en tant qu’artiste, qui depuis l’âge de 3 ans ne cesse d’éblouir ceux qui la côtoient et la découvrent… Issue d’une famille chrétienne, avec comme moteur de son talent, sa mère, qui lui a inculqué le plaisir de chanter, la joie que procure l’écoute de belles mélodies, et l’importance de ces somptueu- ses musiques qui accompagnent ces artistes de renom du Jazz, de la Biguine, ou du Gospel. Jessica Dorsey véhicule des valeurs authentiques chères aux familles antillaises, et qui sont depuis toujours le mortier de nos cultures. Elle est issue d’une famille chrétienne qui a su lui inculquer la valeur du travail et de ses récompenses, la satisfaction d’une journée de labeur pour le bien de la communauté et de sa famille. Jessica revendique ses racines et son terroir antillais et tout ce qui le caractérise. Elle est attachée à son environnement naturel et culturel.